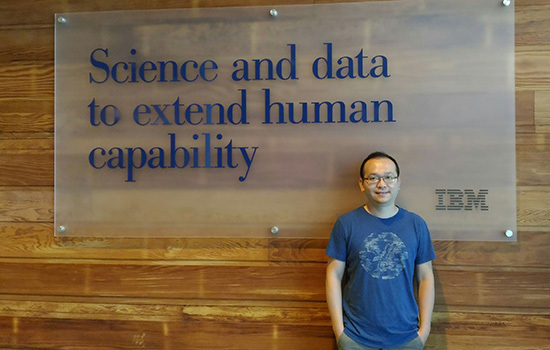 Ken Wong ’10 (computing and information sciences) is working with IBM Watson Health to help save lives. As a research staff member at IBM Research since earlier this year, Wong is teaching the artificially intelligent computer system Watson—made famous by its winning run on the quiz show Jeopardy!—how to identify specific features in X-rays, MRI scans and other medical images. Using Wong’s work and the cognitive computing power of Watson, doctors will be able to diagnose diseases faster and more accurately. Wong began his work with computational physiology and medical image analysis as a student at Hong Kong University of Science and Technology. In 2007, he made his way to RIT on the tails of his Ph.D. adviser, Pengcheng Shi. Shi had been hired to lead the new Ph.D. program in RIT’s B. Thomas Golisano College of Computing and Information Sciences. The interdisciplinary degree would allow Ph.D. students to conduct both hard-core computing research and work in other fields—including medicine, art and engineering—that can be assisted, enabled and inspired by research in computing. As a student, Wong’s research challenged him to use imaging data to understand the mechanics of the human heart. Collaborating with Linwei Wang, fellow Ph.D. student and current associate professor in the Ph.D. program at RIT, the team created a computer simulation of the complete electro-mechanical physiology of the heart. After graduating, Wong continued this work and moved to France to become co-leader for the $25 million euHeart Project with the French Institute for Research in Computer Science and Automation. The group developed individualized, computer-based, human heart models that could provide insight into the origin and progression of specific disease patterns, including those associated with heart rhythm disorders and coronary artery disease. Wong has tested the waters in academia—teaching several Ph.D. courses at RIT as a visiting assistant professor. He also spent time at the National Institutes of Health creating personalized models for predicting tumor growth. Graduates take on roles in computer theory, networking, software engineering, finance, big data, animation, cybersecurity and academia. They work at Intel, Qatar Computing Research Institute, Google, Microsoft, Uber, RIT and Stevens Institute of Technology.